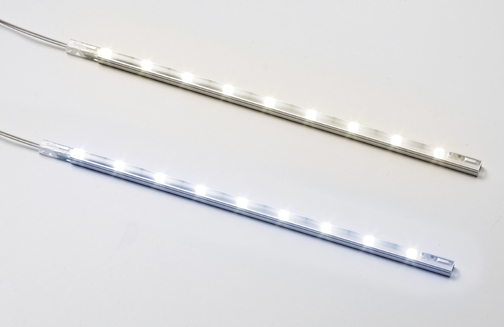 Wellborn has partnered with Häfele to bring you the Loox Lighting program. 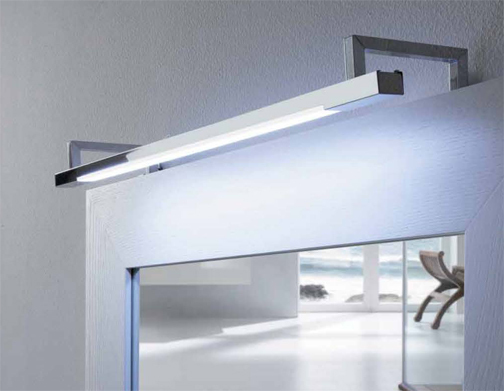 Loox Lighting offers a well rounded selection of lighting for you to choose from. In addition, Aspire's specific options now include options to factory prep the cabinets. 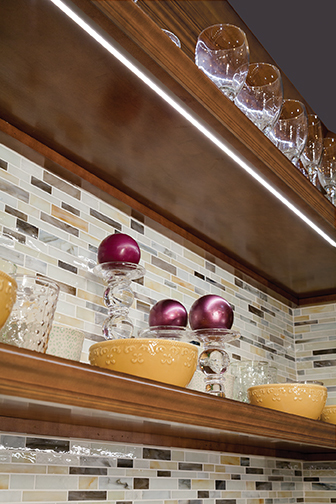 Lighting is a key element in kitchen & bath designs. Proper illumination can make or break the look and functionality of your room. You want to light only what you want to see and draw the eye away from things you do not want noticed. Proper lighting is essential to creating the right mood and really brings a home all together in the end. No single light source can provide all the necessary light for a kitchen. A well-lit kitchen layers and blends four different types of light. 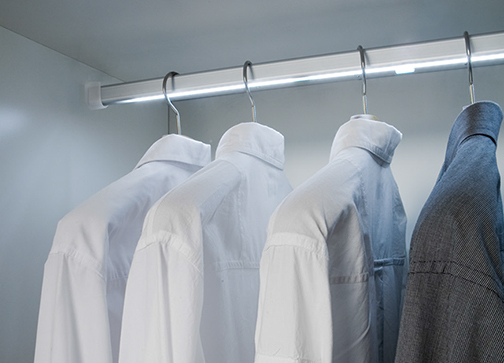 With the Loox LED lighting system it's easy to develop and plan light ideas. 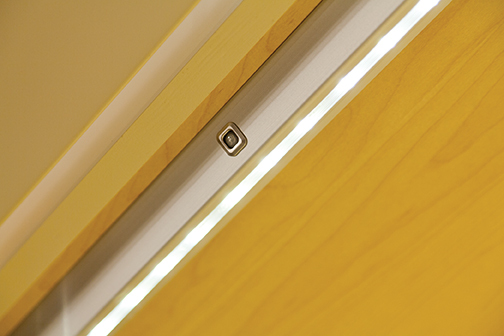 A wide selection of components ranging from light fixtures to switches gives you the flexibility to meet any lighting challenge. 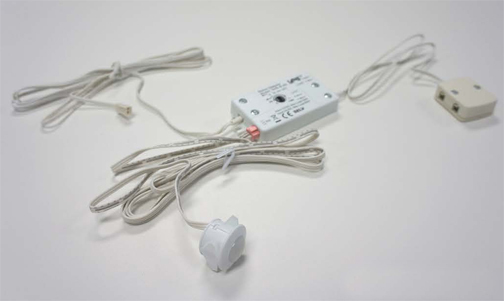 The easy-to-use plug-in components with clearly marked color coding connect all elements with a compact driver. Large systems with multiple or different drivers can also be created. 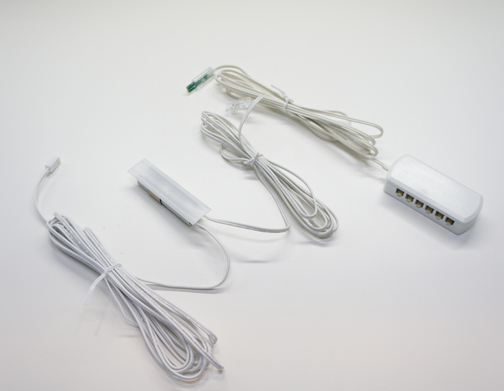 And all components are quality-certified providing long-term reliability and peace of mind. Task Lighting is really focused lighting that helps you complete a certain task, like reading, writing, crafting, cooking applying makeup etc. It makes it easier to perform your work or task. 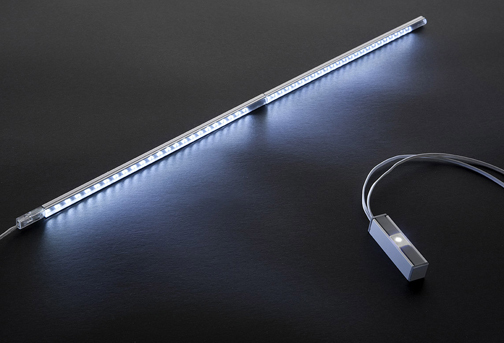 By utilizing this type of lighting, you can reduce eyestrain and the physical discomforts that come with it. 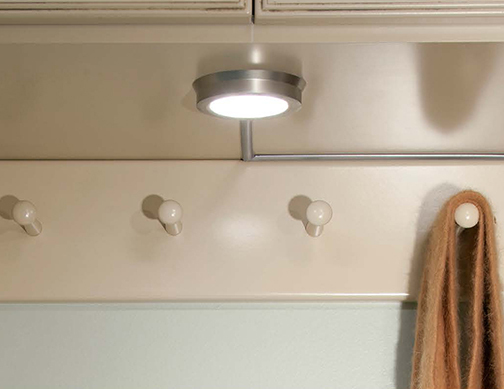 Under Cabinet Lighting is an example of task lighting, under cabinet LED lights adds value to kitchens and any other room where extra light is needed. 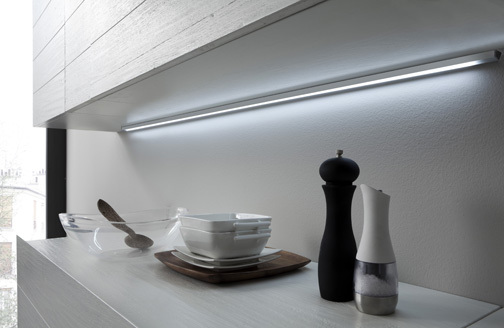 The versatility and combinations of components in the Loox LED under cabinet lighting system creates new opportunities to seamlessly enliven both the beauty and the functionality of any room. 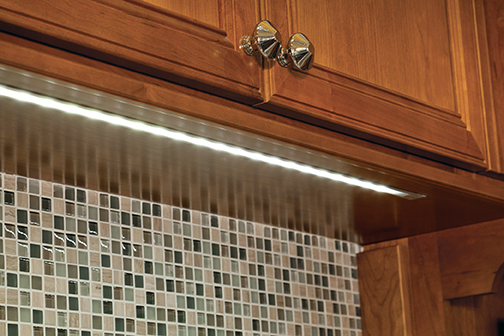 Because LEDs are small and directional, they are ideal for lighting countertops for cooking and reading recipes. 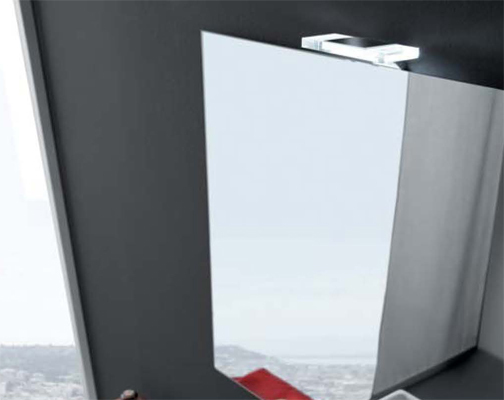 Optimum placement of task lighting comes between a person's head and the work surface. 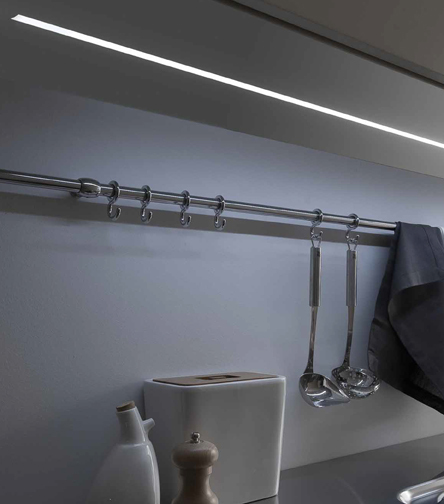 Häfele combines knowledge of under cabinet lighting with the innovation and global engineering expertise to create the highest quality LED under cabinet lighting applications. Accent Lighting adds drama to a room by creating visual interest. It can be used to add depth and dimension to a kitchen or bathroom, create focal points or spotlight a possession. It is important to do accent lighting right, which means subtly. You want people to notice your possession, not the lighting. Lighting fixtures placed inside a glass-front cabinet can illuminate glassware, china and other collectables. Backlighting and uplighting are both great ways to add a halo around a piece of art. 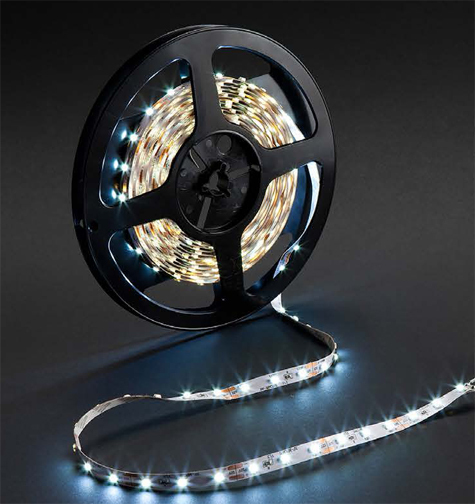 Picture Lights: Special lights just to mount above art that you want proudly displayed. Loox low heat emission, lighting is wonderful for displaying works of Art. The low levels of heat will not hurt pieces of art. Under Counter Lights: These are great for kitchens because the brighten up the room and show off unique touches such as backsplashes or countertops. These are also fantastic to display items on shelves, in nooks or on the countertop. Can be direct or indirect depending on the atmosphere you are trying to create. 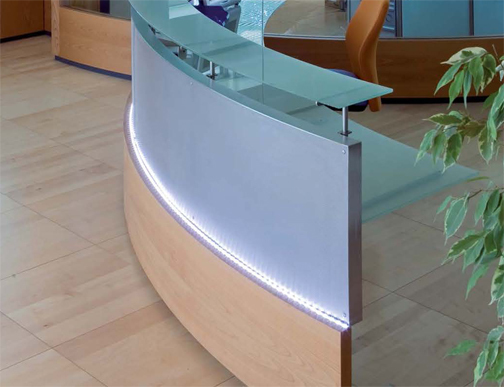 This type of lighting is used to set an impression upon visiting family, friends or clients. It can make a space seem warm and cozy or crisp and cool. Studies have shown that blue light is great for increasing productivity and mood. Ambiance lighting sets the tone of the room. 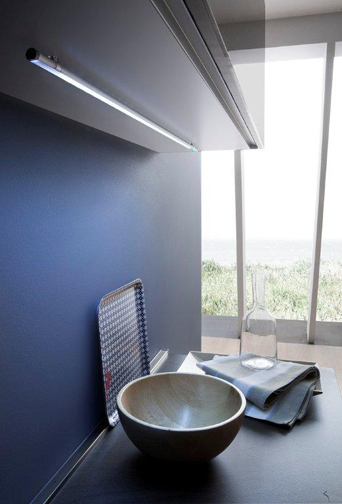 Recessed lighting works with any dÈcor by blending perfectly within the ceiling. 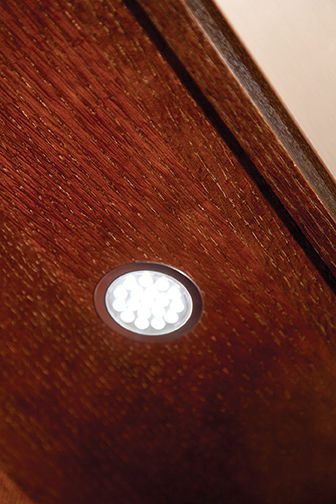 Dimmers are a great way to control ambiance lighting. Example: reducing the lighting while dining creates a close intimate area for lingering over a meal and conversing. With the Loox LED lighting system work areas, relaxation areas and living rooms can be illuminated for functional and decorative purposes. 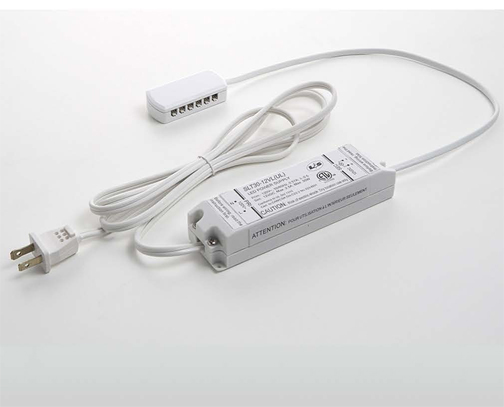 Häfele's Loox Lighting systems and products provide you with a high quality LED lighting solution that you can depend on. In addition to the product Häfele offers lighting design help to all Wellborn Dealers, lighting layout design experts who can make your next project a dream come true. They will provide you with a clear drawing and material list for lighting designs of any complexity using the items found within the Wellborn program. The best part is that there is NO CHARGE for this design service for registered Häfele customers. 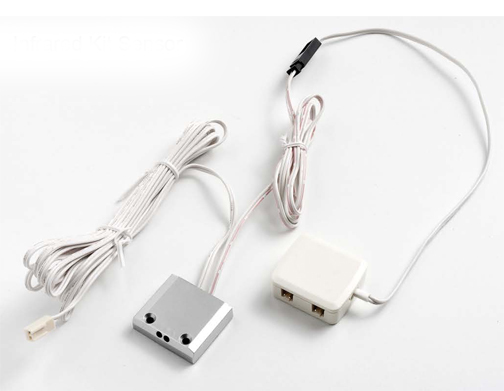 Typical turn around time for a customized lighting layout and price estimate for the Häfele LED lighting components required typically turnaround within 48-72 hrs. Häfele also provides a technical and installation advice Project Services Line available from 8:00a.m. to 5:00 p.m. EST. Put Häfele's Design experts to work for you for free today. Catalog of parts needed to create the gallery photos above.